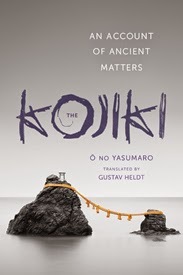 Columbia University Press is pleased to announce the publication of The Kojiki: An Account of Ancient Matters by Ō no Yasumaro and translated by Gustav Heldt. * The narrative is a compilation of myths, history, songs, legends, genealogies, and other disparate works from which written history and literature were later created. "Heldt’s new, complete, and contemporary translation brings vibrancy and clarity to this often politicized work of ancient Japan. The poetry is rendered exquisitely, the narratives unfold with clarity; the translation itself is at once impeccable and imaginative. A master work that will generate discussions far into the future." Japan’s oldest surviving narrative, the eighth-century Kojiki, chronicles the mythical origins of its islands and their ruling dynasty through a diverse array of genealogies, tales, and songs that have helped to shape the modern nation’s views of its ancient past. Gustav Heldt’s engaging new translation of this revered classic aims to make the Kojiki accessible to contemporary readers while staying true to the distinctively dramatic and evocative appeal of the original’s language. It conveys the rhythms that structure the Kojiki’s animated style of storytelling and translates the names of its many people and places to clarify their significance within the narrative. An introduction, glossaries, maps, and bibliographies offer a wealth of additional information about Japan’s earliest extant record of its history, literature, and religion. Ō no Yasumaro (d. 723) was a nobleman of the Japanese court whose Ō clan ruled over an area bearing the same name near the eighth-century capital of Nara. Today's recommended viewing： this excellent film adaptation of Oscar Wilde's The Importance of Being Earnest, A Trivial Comedy for Serious People (1895; 2002, in full). Starring Rupert Everett / Colin Firth / Reese Witherspoon / Judi Dench. I counted 243 jokes in the film; how many can you find?